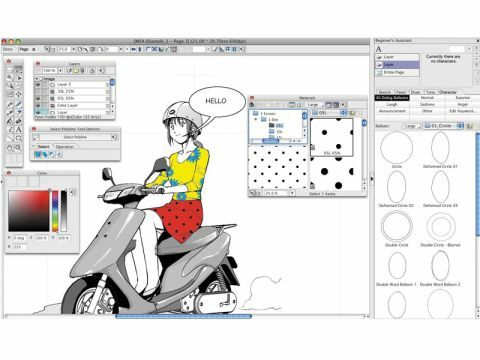 For some years now, Smith Micro's Manga Studio has been the core application in the world of comic-book design and layout. It's used throughout the manga industry in Japan, where it's known as Comic Creator, while Western artists such as Watchmen creator Dave Gibbons are vocal fans of the application. Manga Studio works by mimicking a traditional, three-stage comic-book creation, sketching out characters and action, inking the scene, then colouring the cells and adding detail. Debut is the stripped-back version of Manga Studio 4 EX, the professional version. Debut differs little in its approach to comic creation, but lacks some of the more advanced colouring and productivity options Studio 4 EX packs. For newcomers, an excellent Beginner's Assistant groups together commonly used tools, offering tips-bubbles on rollover that tie into the 160 bundled template projects. It's an effective way of getting to grips with the core tools, and quickly offers the confidence to start experimenting in the sketching and colouring process. Once the methods and toolsets are clear, you can import a scanned sketch as a PSD, TIFF, JPEG or a range of other formats, or use the Pen and Brush tools to create from scratch. Image imports are placed as new layers, meaning a mix of imported and original elements can be layered independently on the canvas. The second-stage inking process is a simple and effective way of outlining sketches. A new Layer is created, and the Pen and Brush tools are easy to adjust and edit mishaps with, while a semi-smart function snaps to the underlying sketch outlines. This is a very effective process, and prepares artwork for adding word balloons, tones and other page furnishings. Of these, there are now 2,300 bundled screen tones, including 80 pattern brushes for adding shading, halftone effects and a range of character embellishments in a drag-and-drop motion. The texture intelligently fills the area to which it's dragged, combining with other textures for an interesting and effective range of finishes, which can be perfected with the new Dodge, Blur and Blend tools to refine your shading and line work. Colouring works in a similar manner, with a simple mixing palette and editable swatch library available, and precision choices made through an RGB colour slider. Preset colour libraries are bundled too, helping suggest interesting colours for your illustrated creations. Panel Ruler Cutter works by carving sketches into cells with a range of styles to choose from. This is great to use, with the new cell borders added as Layers with effects such as speed lines and backgrounds available for extra punch. Debut's text support is also good. The word balloon library and tool allows you to drag and drop balloons into place before adding text (text can also be imported in). Font and text formatting are superb, and the ability to export to BMP, JPEG, PNG, PSD, TGA, TIFF, PDF or upload to a blog or social networking site excellently rounds things off.